Watershed management is basically management of two most important natural resources i.e. Soil and Water. Both of these natural resources are closely associated to each other. Soil management in a watershed is done so as to maintain the soil fertility its productivity .The soil fertility is the inherent capacity of the soil and is dependent on physical, biological and chemical properties of the soil. Biological properties play a vital role in soil fertility and its productivity. It enhances the soil nutrition in natural way and further ensures the uptake of macro and micro nutrients by the plant. The microorganism and the earthworm in the soil through decomposition action improve the biological properties of the soil. 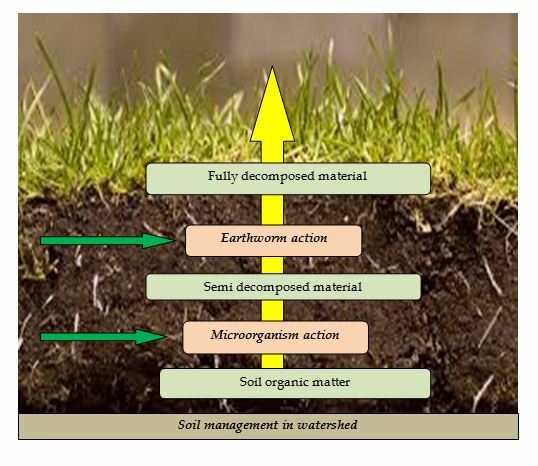 The presence of carbonic /Organic material in the soil is prerequisite for effective biological action. The microorganism in the soil first convert the available carbonic material in to semi decomposed material. Later on the earthworm in the soil converts the semi decomposed material in to vermicast (in full decomposed form). So, by action of microorganism and earthworm the carbonic content of the soil get converted in natural available high quality manure that in turn increase the soil fertility. Watershed management through watershed programmes ensures that the sufficient amount of carbonic material is added in the soil by the farmers. It also sensitizes the farmers regarding the significance of carbonic material in the soil. This is an important step for sustainable management of watershed.